Last week one of my Endava colleagues came over to my desk in the office and caught a glimpse of my Outlook Inbox. The way I organise my email is really simple – unread emails in my Inbox constitute my Items To Do. Once I’ve acted upon the email, or strictly speaking, the item-to-do, I then delete the email. I could just rename the Deleted Items folder as Done – to me it’s the same thing because I keep all the emails in my Deleted Items anyway. To my Endava colleague, my extra simple organisation of Inbox and Deleted Items was alien – they preferred multiple folders, and Follow Up flags, and categories (which I do use in the Calendar, but not email). In fact, she was most upset that most of her emails appeared in my Deleted Items folder – because I’d acted upon them, and not filed away in a project folder . If I’m out and about, or at home, and I think of something I need to do, I send a one line email to myself so I don’t forget it the next time I’ve got Outlook open. I’ve tried Evernote, OneNote, Outlook Tasks, various other Task management systems, but I’ve veered away from them over time and kept returning to my tried and tested Outlook Inbox method. And I organise my personal emails using a similar method using Google Mail. I have several hobbies and my Gmail/Inbox allows me to usually keep on top of tasks. A fortnight ago I was invited on to Google’s latest release of Gmail, called Inbox. 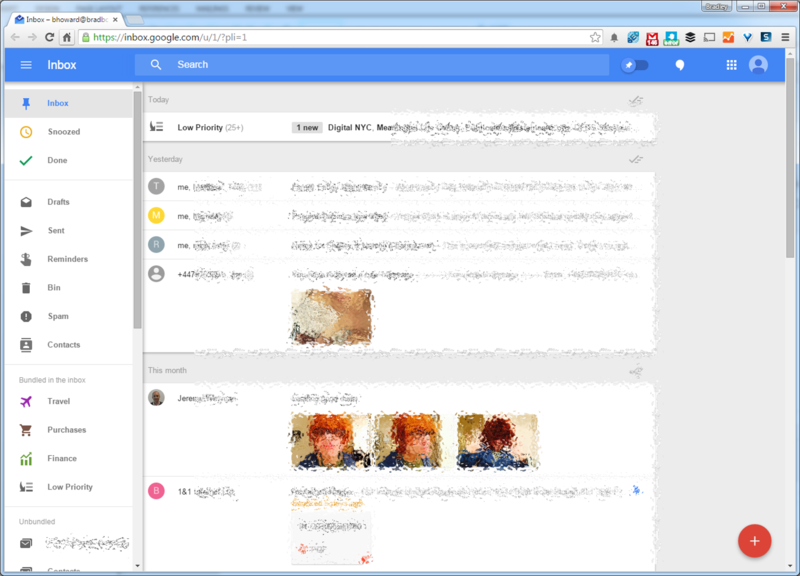 I’ve used several incarnations of Google’s mail experiments. In 2009 I was on the Google Wave beta programme and thought it was brilliant for project teams – it combined chat with email. How many times have you inserted your comments into someone’s email in a different colour, then someone else has inserted their comments in a different colour, only for another person to reply to an older email with their comments? Wave solved this problem perfectly. The problem was that everyone else needed to be using Wave too. Email at the time (and still is today) too entrenched to require all users to move to a different system, and Wave was terminated only a few months after public release. Google Inbox is different though – it uses standard email, and to all purposes, it is email. But it turns all emails into tasks. Once you open an email, you either “Flag it” as done, and it disappears, or you set a snooze timer to remind you to act on it later. Items which have been snoozed and passed their time are then prioritised at the top of the Inbox – and you can re-snooze them. For me, the system is perfect. It’s pretty much exactly how I run my Outlook Inbox already. Google also make a point of automatically grouping emails – so your purchases appear together, travel emails appear together and so on. Google also bunches Low Priority items – presumably based on whether you usually open them, or they are mild-Spam as I like to call them – those newsletters which you open occasionally but don’t quite want to unsubscribe from. I’ve replaced my Gmail mobile app with the Inbox app, and exclusively use Inbox now. I saw my wife using Gmail recently and it already looks dated and too simple. Inbox is still in a trial phase, or invitation only. Google usually keep products in this phase for around six months. If you receive an invitation, I recommend you give it a try. Google Inbox is also available by invitation to Google Apps for Business customers. This demonstrates a more serious side to Inbox… while many business users are stuck with Outlook, even the very latest version (2013) hasn’t changed for almost three years. The amount of email has risen in the last three years, and users want help dealing with all this extra stuff coming through. During that time Outlook has stood still, while Google’s cloud applications are evolving – constantly improving features and functionality. Rolling out an updated version of Outlook to an organisation takes some time and cost. Rolling out Inbox to an organisation might increase the number of support calls for a short time, but as soon as those users are using Inbox on their personal account, the support calls will reduce. And this demonstrates the power of the cloud. The Inbox looks interesting. I think it deserves more attention & usage.